Context: Medicinal practices of the tribes of Bangladesh remain largely un-documented. Aims: The aim of the present study was to conduct an ethnomedicinal survey and documentation among the Nag clan of the Rai Ghatual tribe of Bangladesh. Settings and Design: The survey was carried out among the Nag clan of the Rai Ghatual tribal community of Moulvibazar district. The clan, according to them, is the only Nag clan of the Rai Ghatual tribe in Bangladesh. The clan has three tribal healers, still continuing their traditional medicinal practices. Materials and Methods: Interviews of the healers were carried out with the help of a semi-structured questionnaire and the guided field-walk method. 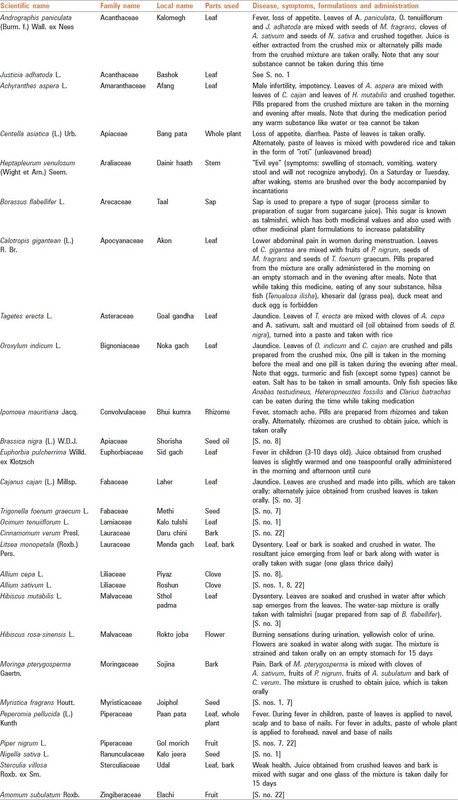 Results: The Nag clan healers were observed to use 28 different plant species distributed into 22 families for treatment of ailments such as fever, loss of appetite, male infertility, dysentery, lower abdominal pain during menstruation, jaundice, stomachache, burning sensations during urination, bodily pain and weak health. Conclusions: This is the first reported study of the traditional medicinal practices of Nag clan healers. Several of the plants can be validated in their uses on the basis of existing scientific literature. The medicinal plants used by the Nag healers warrant further scientific studies, for the plants are readily available and can form alternative medicinal sources instead of costlier biomedical drugs. Documentation of indigenous medicinal practices is important not only from the point of view of anthropology, but more so because many important modern drugs have come out following close observations of the traditional medicinal practices of indigenous communities. Bangladesh has a number of indigenous communities (otherwise referred to as tribes), many of these communities are composed of clans and sub-clans. With the exception of about a dozen tribes, socio-cultural data on the other tribes are scant or absent because many such tribes have dwindled into such small numbers that they are no longer accounted for in population censuses and considered as members of the mainstream Bengali-speaking population. Quite a number of these small tribes can be found as "pocket" communities working in the various tea estates of Moulvibazar district, which falls in the Sylhet division of Bangladesh. A few reports on the indigenous medicinal practices of the tribes of Bangladesh have only recently been published. ,,,,,,,, However, more studies are needed to get an overall picture of the medicinal practices of all the tribes of Bangladesh. The Nag clan of the Rai Ghatual tribe was located in a tea estate at Tanki Tila village in Moulvibazar district of Bangladesh. The tribal population numbers around 700 (according to their own estimate) and all adult members (around 150) worked in the tea estate. They claimed themselves to be "Sonaton" Hindus, with their main festivals being Bish Hari puja and "Holi" festival. Though small, the tribe had three practicing tribal healers, their names being Joy Roy, Laxmicharan Roy and Sunil Roy. Informed consent was obtained from the tribal healers. Repeated visits were made to the healers during the whole of 2012, the purposes of the visits explained to them and consent obtained to disseminate any information collected. Interviews were conducted in Bengali with the help of a semi-structured questionnaire and the guided field-walk method of Martin  and Maundu. In this method, the healers took the interviewers on guided field-walks through areas from where they collected their medicinal plants, pointed out the plants and described their uses. Plant specimens were collected and photographed on the spot, dried and later brought back to Dhaka for proper identification at the Bangladesh National Herbarium. Voucher specimens were deposited in the Medicinal Plant Collection Wing of the University. The healers were observed to use a total of 28 plants distributed into 22 families for treatment of various ailments. The various ailments treated included fever, loss of appetite, male infertility, gastrointestinal disorders (such as diarrhea and dysentery), lower abdominal pain during menstruation, jaundice, stomach ache, burning sensations during urination, bodily pain and weak health. One formulation was used to treat what the healers mentioned as "evil eye" [Table 1]. "Evil eye," according to the healers is said to be "cast" when somebody "eyed" another person with jealousy or covetousness. The various symptoms of "evil eye" included swelling of stomach, vomiting, watery stool and loss of cognitive functions, i.e. the patient became unable to recognize anybody. Although these symptoms can be seen in patients with severe gastrointestinal disorders, where frequent passage of watery stools can lead to dehydration and ionic imbalances with consequential impairment of cognitive faculties because of weakness, the healers distinguished "evil eye" from diarrhea or dysentery because according to them, loss of cognitive functions did not occur during diarrhea or dysentery. Both complex and simple formulations were observed to be used by the healers. For instance, a complex formulation for treatment of fever and loss of appetite consisted of leaves of Andrographis paniculata (Burm. f.) Wall. ex Nees, Ocimum tenuiiflorum L. and Justicia adhatoda L. along with seeds of Myristica fragrans Houtt. and Nigella sativa L., to which were added cloves of Allium sativum L. The various plant parts were mixed and juice obtained from the crushed mixture or pills made from the crushed mixture were administered orally. The healers apparently understood adverse effects of improper diet while undergoing treatment. The patients were advised not to eat any sour substance while taking this formulation. A paste of leaves of Centella asiatica (L.) Urban was orally administered for loss of appetite and diarrhea. In another formulation used by the healers for treatment of lower abdominal pain during menstruation in women, the patients were advised not only not to take any sour substance, but also hilsa fish, grass pea, duck meat and duck eggs [S. No. 7, [Table 1]. In a third formulation for treatment of jaundice [S. No. 9, [Table 1], patients were forbidden to take any eggs, turmeric and any fish, with the exception of three fish species. Furthermore in this case, patients were advised to take salt only sparingly. In addition to the medicinal plant formulations shown in [Table 1], the Nag healers also used two incantations in their remedies. The first incantation was recited in front of every patient prior to giving the patient any medication. The second incantation was uttered in front of a snake-bitten person followed by blowing on the person. Achyranthes aspera L. was used by the Nag healers for treatment of impotence; such use has been reported for traditional medicine in various countries;  inhibitory activity of C. asiatica has been observed against enteric pathogens,  the plant being used by the Nag healers for treatment of diarrhea. A combination of a number of plants, namely Calotropis gigantean (L.) R. Br., Piper nigrum L., M. fragrans and Trigonella foenum graecum L. was used by the Nag healers for treatment of lower abdominal pain during menstruation; analgesic effect of C. gigantea has been reported. Piperine isolated from P. nigrum also reportedly has analgesic properties;  the analgesic effects of ethanolic extract of M. fragrans has been described;  the analgesic and anti-inflammatory activities of T. foenum graecum seed extract has also been reported in mice. Thus, the combination of plants used by the Nag healers for treatment of lower abdominal pain can have synergistic actions and so exert a powerful analgesic effect. Cajanus cajan (L.) Millsp. reportedly is used by various ethnic groups in Africa for treatment of jaundice;  a similar use was made of the plant by the Nag healers. Litsea monopetala (Roxb.) Persoon, used by the Nag healers for treatment of dysentery has similar ethnomedicinal uses in other parts of Bangladesh. Moringa pterygosperma Gaertn. was used by the Nag healers for treatment of pain. Analgesic effect of ethanolic extract of the plant has been demonstrated in pain-induced mice model. Four other plant parts were used by the Nag healers in combination with M. pterygosperma for treatment of pain, namely A. sativum, P. nigrum, Amomum subulatum Roxb. and Cinnamomum verum Presl. The analgesic property of piperine isolated from P. nigrum has been discussed previously. Analgesic and anti-nociceptive properties of A. sativum has been shown in experimental animal studies. Analgesic activity of A. subulatum, and hydroalcoholic extract of C. verum has also been reported. Thus, once again, as has been demonstrated for a previous formulation, the various plant parts used by the Nag healers have been demonstrated to possess individual analgesic activities and hence, they can together exert a synergistic effect for alleviation of pain. Peperomia pellucida (L.) Kunth was used by the Nag healers for treatment of fever. Anti-pyretic activity of leaves of the plant has been reported. It is interesting that the Nag healers did not administer the leaves of the plant orally; rather they used a paste of leaves of the plant topically. However, it is very much possible that possible anti-pyretic components of the plant may be absorbed through the skin and so exert the desired effect of reducing fever. Cumulatively speaking, it can be said that quite a number of the plants used by the Nag healers have been validated in their uses through scientific research, which once again goes on to show the remarkable knowledge of medicinal properties of plants possessed by these healers. It is expected that more scientific studies on the plants can lead to identification of bio-active compounds, which can prove to be effective drugs. Simultaneously, recognition of medicinal efficacy of these plants can spur conservation efforts of these plant species. 1. Gilani AH, Rahman AU. Trends in ethnopharmocology. J Ethnopharmacol 2005;100:43-9. 2. Rahmatullah M, Hanif A, Hossan MS, Mollik MA, Rahman T, Chowdhury MH, et al. An ethnomedicinal survey of the Chakma tribe of Bandarban district, Bangladesh and a pharmacological and nutritive evaluation of their medicinal plants which can be used as food supplements. J Phytomedicine Ther 2009;14:7-16. 3. Rahmatullah M, Mollik AH, Rahman S, Hasan N, Agarwala B, Jahan R. A medicinal plant study of the Santal tribe in Rangpur district, Bangladesh. J Altern Complement Med 2010;16:419-25. 4. Rahmatullah M, Rahman MA, Hossan MS, Taufiq-Ur-Rahman M, Jahan R, Mollik MA. A pharmacological and phytochemical evaluation of medicinal plants used by the Harbang clan of the Tripura tribal community of Mirsharai area, Chittagong district, Bangladesh. J Altern Complement Med 2010;16:769-85. 5. Seraj S, Rahmatullah M, Monjur-E-Khudha M, Aporna SA, Khan MS, Jahan R. Amulets and other uncommon treatments prescribed by traditional medicinal practitioners of the Bede community residing in Porabari village of Dhaka district, Bangladesh. J Altern Complement Med 2011;17:987-93. 6. Rahmatullah M, Haque ME, Mondol MR, Mandal A, Azad MA, Seraj S, et al. Medicinal plants of the Hodis: A disappearing tribe of Bangladesh. J Altern Complement Med 2011;17:1103-8. 7. Rahmatullah M, Biswas KR. Traditional medicinal practices of a Sardar healer of the Sardar (Dhangor) community of Bangladesh. J Altern Complement Med 2012;18:10-9. 8. Rahmatullah M, Khatun Z, Hasan A, Parvin W, Moniruzzaman M, Khatun A, et al. Survey and scientific evaluation of medicinal plants used by the Pahan and Teli tribal communities of Natore district, Bangladesh. Afr J Tradit Complement Altern Med 2012;9:366-73. 9. Rahmatullah M, Azam MN, Khatun Z, Seraj S, Islam F, Rahman MA, et al. Medicinal plants used for treatment of diabetes by the Marakh sect of the Garo tribe living in Mymensingh district, Bangladesh. Afr J Tradit Complement Altern Med 2012;9:380-5. 10. Rahmatullah M, Ayman U, Akter F, Sarker M, Sifa R, Sarker B, et al. Medicinal formulations of a Kanda tribal healer - A tribe on the verge of disappearance in Bangladesh. Afr J Tradit Complement Altern Med 2012;10:213-22. 11. Martin GJ. Ethnobotany: A 'People and Plants' Conservation Manual. London: Chapman and Hall; 1995. 12. Maundu P. Methodology for collecting and sharing indigenous knowledge: a case study. Indigenous Knowl Dev Monit 1995;3:3-5. 13. Deng WL. Preliminary studies on the pharmacology of the Andrographis product dihydroandrographolide sodium succinate. Newsl Chin Herbal Med 1978;8:26-8. 14. Mohan L, Amberkar MV, Kumari M. Ocimum sanctum Linn (Tulsi) - An overview. Int J Pharm Sci Rev Res 2011;7:51-3. 15. Dhankar S, Kaur R, Ruhil S, Balhara M, Dhankar S, Chhillar AK. A review on Justicia adhatoda: a potential source of natural medicine. Afr J Plant Sci 2011;5:620-7. 16. Bamidele O, Akinnuga AM, Alagbonsi IA, Ojo OA, Olorunfemi JO, Akuyoma MA. Effects of ethanolic extract of Myristica fragrans Houtt. (nutmeg) on some heamatological indices in albino rats. Int J Med Med Sci 2011;3:215-8. 17. Hannan A, Rauf K, Ullah MI, Naeem T, Raja M, Qamar MU, et al. Inhibitory effect of aqueous garlic (Allium sativum) extract against clinical isolates of Salmonella typhi. Afr J Microbiol Res 2012;6:4475-80. 18. Paarakh PM. Nigella sativa Linn.- A comprehensive review. Indian J Nat Prod Resour 2010;1:409-29. 19. Dey A. Achyranthes aspera L: Phytochemical and pharmacological aspects. Int J Pharm Sci Rev Res 2011;9:72-82. 20. Mamtha B, Kavitha K, Srinivasan KK, Shivananda PG. An in vitro studyof the effect of Centella asiatica [Indian pennywort] on enteric pathogens. Indian J Pharmacol 2004;36:41. 21. Agrawal A, Singh N, Kannojia P, Garg VK. Pharmacological aspects of Calotropis gigantea on various health problems: A review. Int J Adv Pharm Res 2011;2:613-20. 22. Madhavi BB, Nath AR, Banji D, Madhu MN, Ramalingam R, Swetha D. Extraction, identification, formulation and evaluation of piperine in alginate beads. Int J Pharm Pharm Sci 2009;1:156-61. 23. Joyce OO, Chinwe ND, Bruno CC, Kwaku JPP, Tabot PD. The analgesic effect of ethanolic extract of Myristica fragrans Houtt (nutmeg) on mice. Am J PharmTech Res 2012;2:265-70. 24. Vyas S, Agrawal RP, Solanki P, Trivedi P. Analgesic and anti-inflammatory activities of Trigonella foenum-graecum (seed) extract. Acta Pol Pharm 2008;65:473-6. 25. Adeniji AA, Odukoya OA. Jaundice: Survey of traditional remedies and in-vitro lipid peroxidation as progression of liver injury at the cellular level. J Nat Prod Plant Resour 2012;2:334-43. 26. Ahmmad A, Islam MT, Sultana I, Mahmood A, Hossain JA, Homa Z, et al. Pharmacological and phytochemical screening of ethanol extract of Litsea monopetala (Roxb.) Pers. IOSR J Pharm 2012;2:398-402. 27. Dipti S. Analgesic effect of the ethanolic extract of Moringa oleifera Linn. plant on induced albino mice. Int Res J Pharm 2012;3:372-3. 28. Jayanthi MK, Jyoti MB. Experimental animal studies on analgesic and anti-nociceptive activity of Allium sativum. Indian J Res Rep Med Sci 2012;2:1-6. 29. Shukla SH, Mistry HA, Patel VG, Jogi BV. Pharmacognostical, preliminary phytochemical studies and analgesic activity of Amomum subulatum Roxb. Pharm Sci Monit 2010;1:90-102. 30. Arzi A, Sarkaki A, Aghel N, Nazari Z, Saeidnejad S. Study of analgesic effect of hydroalcoholic extract of cinammom. Sci Med J 2011;10:271-9. 31. Khan A, Rahman M, Islam S. Antipyretic activity of Peperomia pellucida leaves in rabbit. Turk J Biol 2008;32:37-41.